by the professionals. Thank you to all the girls and their parents who have contributed to this season by their presence and support at so many matches. 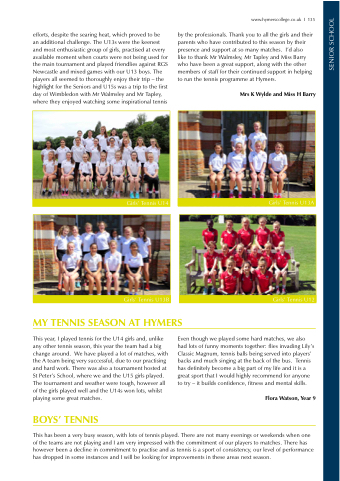 I’d also like to thank Mr Walmsley, Mr Tapley and Miss Barry who have been a great support, along with the other members of staff for their continued support in helping to run the tennis programme at Hymers. This year, I played tennis for the U14 girls and, unlike any other tennis season, this year the team had a big change around. We have played a lot of matches, with the A team being very successful, due to our practising and hard work. There was also a tournament hosted at St Peter’s School, where we and the U15 girls played. The tournament and weather were tough, however all of the girls played well and the U14s won lots, whilst playing some great matches. Even though we played some hard matches, we also had lots of funny moments together: flies invading Lily’s Classic Magnum, tennis balls being served into players’ backs and much singing at the back of the bus. Tennis has definitely become a big part of my life and it is a great sport that I would highly recommend for anyone to try – it builds confidence, fitness and mental skills. This has been a very busy season, with lots of tennis played. There are not many evenings or weekends when one of the teams are not playing and I am very impressed with the commitment of our players to matches. There has however been a decline in commitment to practise and as tennis is a sport of consistency, our level of performance has dropped in some instances and I will be looking for improvements in these areas next season.